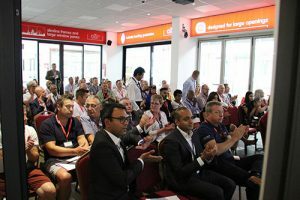 Guest speakers gave attendees practical business advice and insight into the wider economy, the technology landscape and the construction industry. Reena Popat and Jayesh Jotangia from Carter Bond solicitors talked to attendees about the Consumer Rights Act, giving practical advice on how it could affect installers and how they can protect themselves. Certass Chair, Jon Vanstone provided insight on Brexit, the wider construction economy and what’s happening in Government policy that will affect installation companies. Candice Arnold from tech experts Quantiq gave guests the low-down on the rise of the robots and how emerging software and technology can change how homeowners buy and engage with businesses.